We have made another revolution around the sun. Woot! That is about as arbitrary a starting point as any other. So this year, you have decided you are going to “eat better, exercise every day, and walk the dog every night after dinner.” That’s ambitious. Not that those are bad resolutions, but what is your plan? How are you going to overcome challenges? What happens when you just don’t feel like it? Reason #1 Why not to make resolutions: They are too vague. They usually include words like “more” or “better”. But how do you know if you accomplished something “more” or “better”? The number one rule in goal setting is to set a SMART goal. It is an acronym that stands for Specific, Measurable, Attainable, Relevant, and Time-Bound. And finally, it’s time-bound: until Jan 31. At that point, you can set a new goal. Reason #2 why not to make resolutions: There is no plan for overcoming challenges. What do you do when life gets in the way? You plan to walk the dog every night after dinner. But what happens when you have to fly through the drive-through at McDonald’s in order to get the kids to soccer practice, choir concert, volunteering, etc. Now you don’t get home until 9 pm. Can’t walk the dog in the dark. Oh, well. You’ll do it tomorrow. But tomorrow, a whole other list of things interferes with your resolution. And poor Scruffy is paying the price. You need a plan for overcoming these challenges. Maybe you can take Scruffy with you to soccer practice and take him for a walk around the field while practice is going on. Or maybe after dinner is not an ideal time. Maybe picking a time when fewer things are happening, like 5:30 am would work better. Or maybe every night is too much of a commitment. Maybe Scruffy gets two 30 minute walks on Saturday and Sunday. and two 10-15 minute walks on two other weekdays. You must pick goals that are actually achievable for your life. 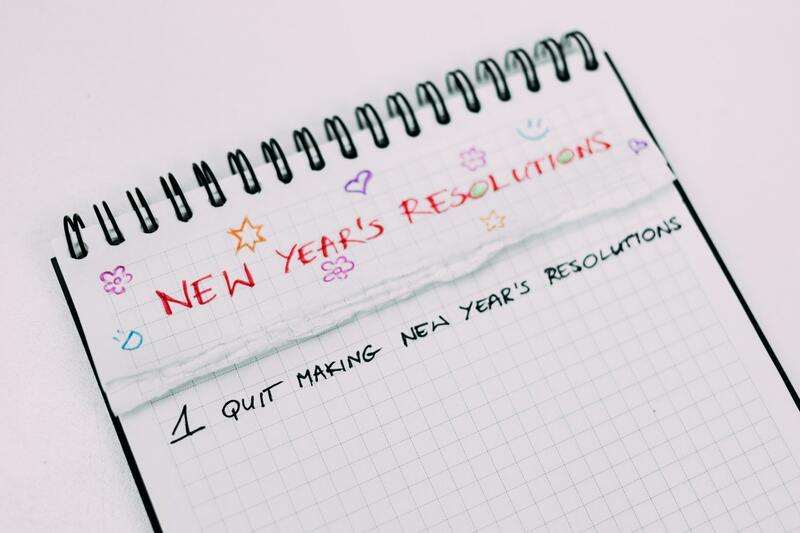 Okay, so what should you do instead of making resolutions? Set a goal to achieve by the end of January. Make it small. Make it doable. Set yourself up for success. Let’s say your goal is to exercise for at least 5 minutes a day every day in January. That is a small, very doable goal. Once you get going, you might find you want to go for longer, and that’s great! But as you’re sitting there on the couch watching “This Is Us” thinking “I don’t wanna….” remind yourself that you are strong and you got this and that it’s a small goal and you can do it on the next commercial break. The average hour-long show is really only 44 minutes. That means somewhere during 16 minutes of commercial breaks, you have time to do some pushups, situps, jogging in place, invisible jump roping or Tabata. You can fit this goal in around the things you already do in your life. And when you’ve achieved that goal at the end of January, set a new goal for February. Again, make it small and doable. Always take into account your lifestyle and set yourself up for success. Happy New Year! Let’s make 2019 the year you achieve your GOALS!